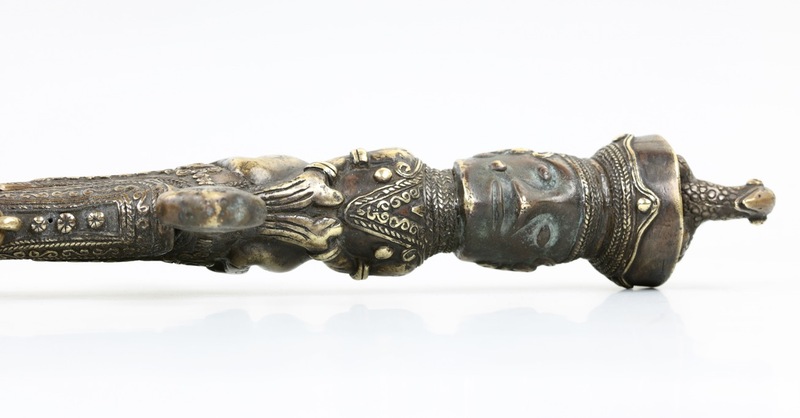 Origin: The Toba Batak of Sumatra, Indonesia. 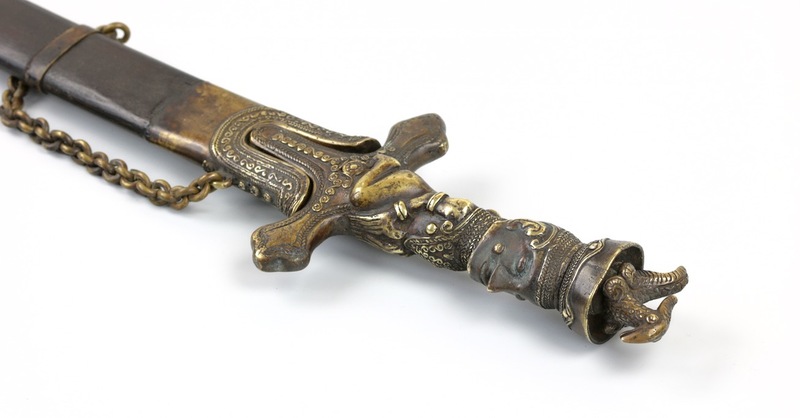 A very rare type of podang ("sword") of the Toba Batak. Such swords are sometimes also called piso podang . ( Piso is a general word for cutting implements, so in describing this sword podang would suffice.) 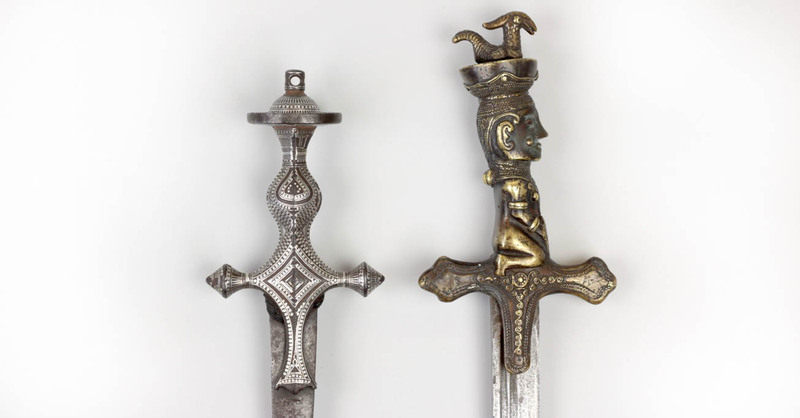 It has a cruciform hilt with langets and a crossguard that seem strongly inspired by hilts of Indian swords. It has a sturdy blade with double grooves on each side that meet at the tip. 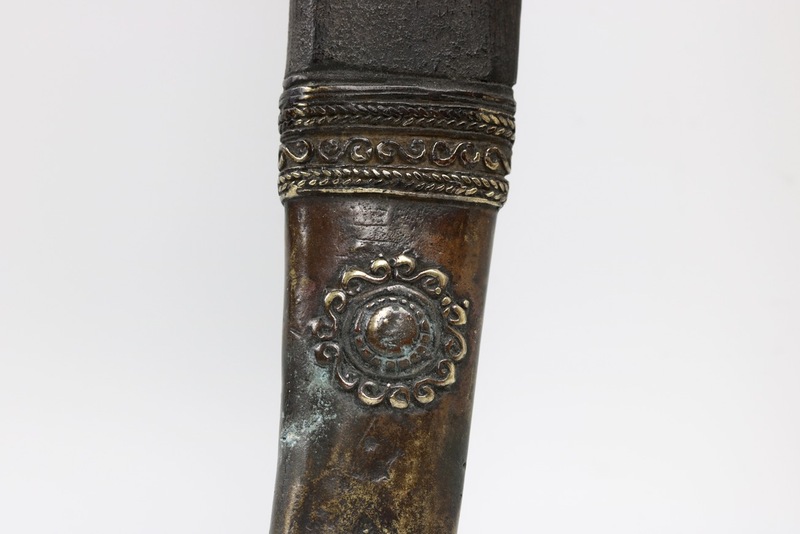 The blade is forge folded, it surface showing a dense and fine pattern, or pamor . It is good quality steel with a stiff, springy temper. 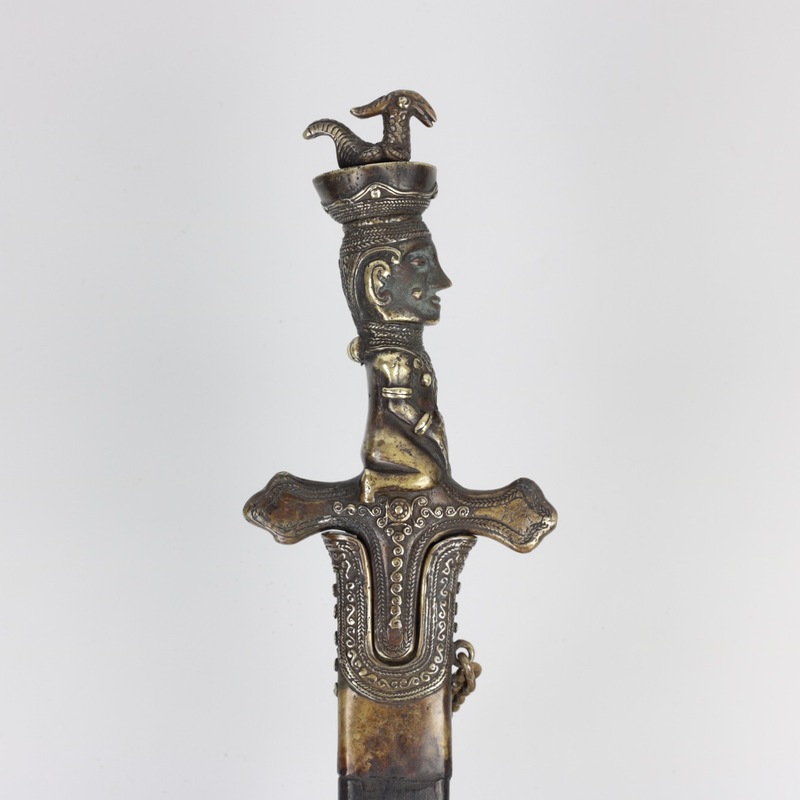 The most striking part of the sword is the cast brass figurative handle. 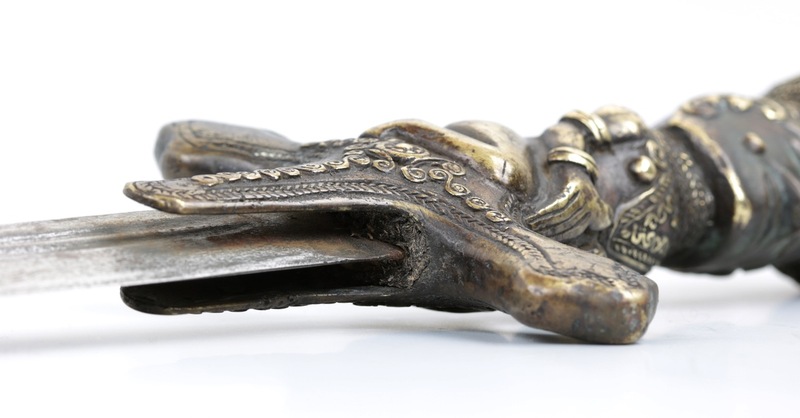 It represents a kneeling figure, his hands touching with the fingers pointing downwards and the thumbs pointing upwards, a typical gesture seen on Toba Batak guardian figures. Around his arms are bracelets and he wears an elaborate necklace. His face has a prominent mould on the right side. He wears a large headdress with a bird in it. These compounds would be inserted in special holes on the statue. 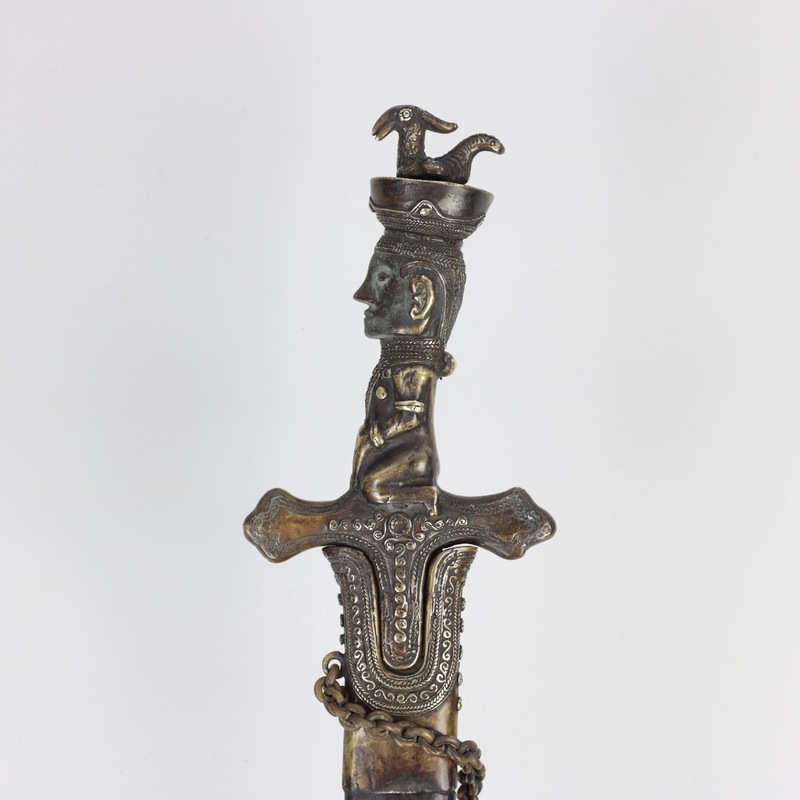 This sword has ample space in the large hat, although it's unclear to me whether it was actually used for this purpose or that resembling an animated pangulubalang was enough in this case. 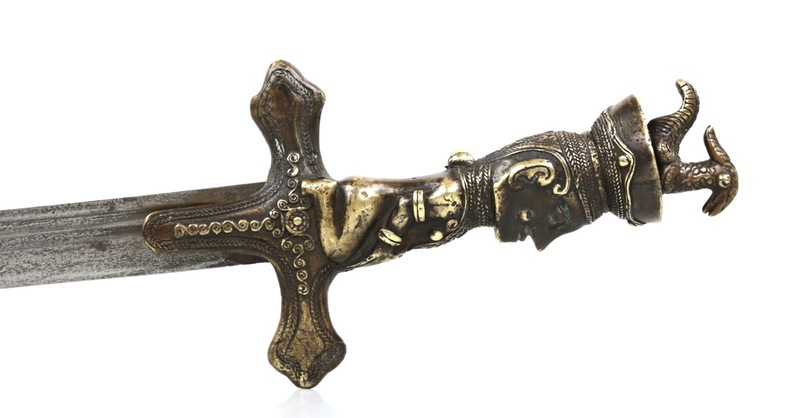 Left a south Indian sword peculiar to the Malabar coast. Right this Toba Batak podang . 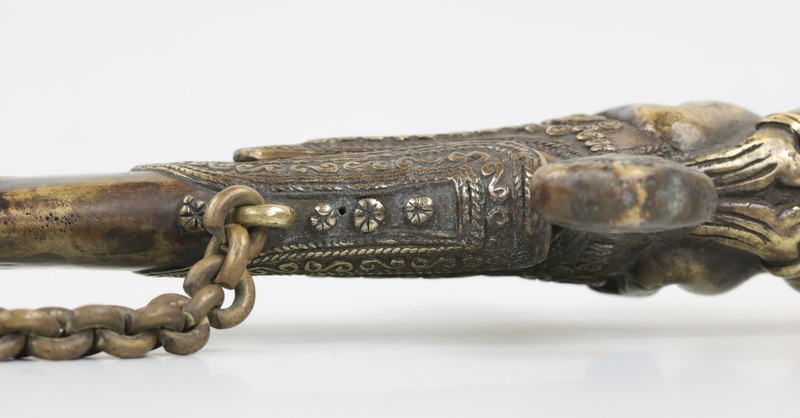 The wooden scabbard is held together by four simple brass bands, and a decorated throat and end pieces. 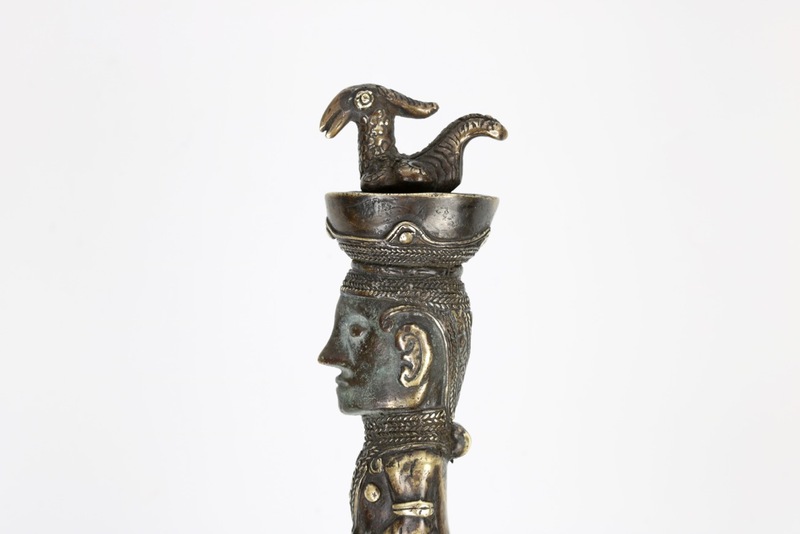 The throat piece has a space to accept the langet of the hilt. There is a brass chain from the last brass band to the throat-piece. 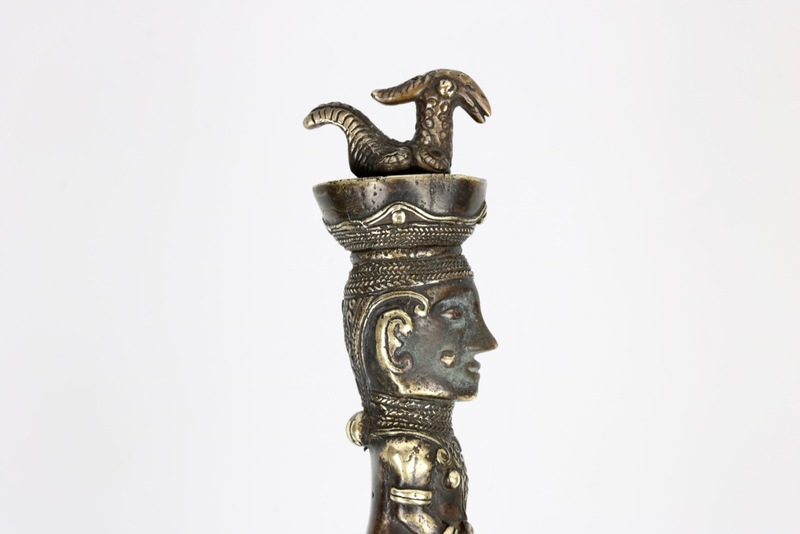 The end piece is decorated with a circular motif on each side and an ornamental three dimensional finial at its end. 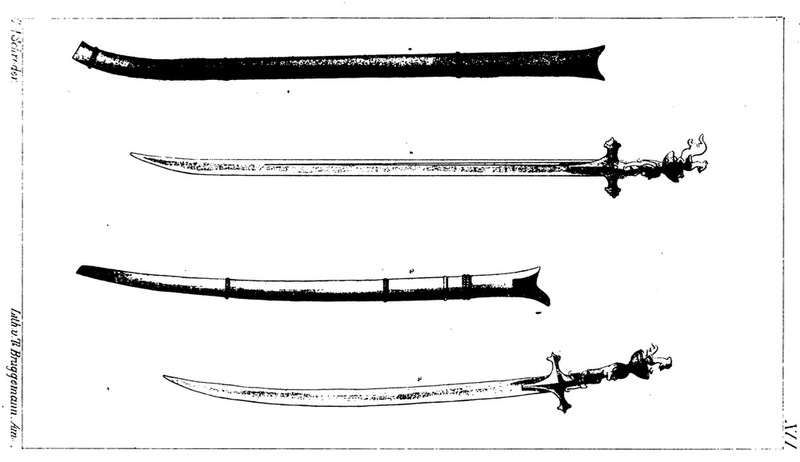 Illustrations of similar swords in Tuuk's Bataksch-Nederduitsch woordenboek of 1861. All in all these examples suggest that the style had reached its mature form already by the mid 19th century. 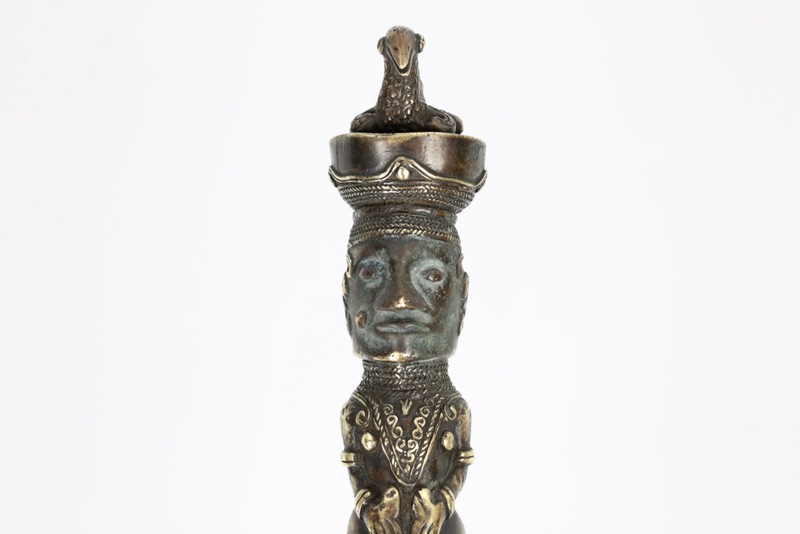 A very rare Toba Batak sword with pangulubalang guardian figure handle, of good quality and in excellent condition. In fact, it seems to be the best of its kind published so far. 1. Kruijt, Alb. C.; Het animisme in den Indischen archipel , Martinus Nijhoff, 's Gravenhage, 1906. Pages 216-220. 2. Tuuk, Hermanus Neubronner van der; Bataksch-Nederduitsch woordenboek . F. Muller, Amsterdam, 1861. Plate XVI. 3. 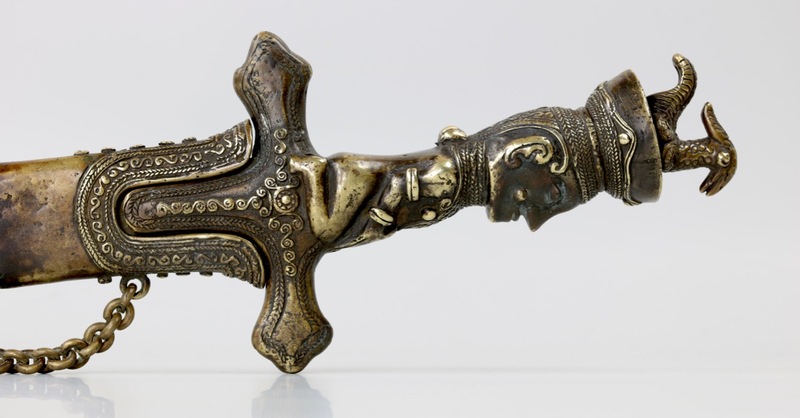 Zonneveld, Albert van; Traditional weapons of the Indonesian archipelago . C. Zwartenkot Art Books, Leiden. Page 110. 4. 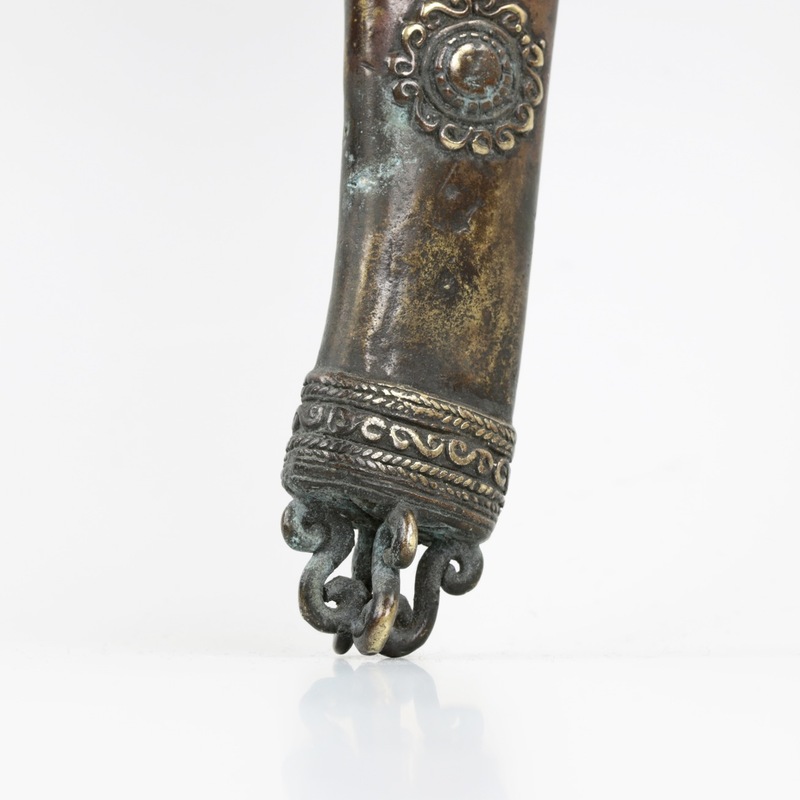 This example was published in: Budaya Indonesia, kunst en cultuur in Indonesië. 1987, p. 209, 279, nr. 295 and De Bataks op weg , exhibition catalot of the Etnographic Museum Delft 1967-1968, cat. nr. 274.